No housework here, folks | carpe diem! If I had a picture of my Wing o’ the Moth shawl I could show you a picture, but the first attempt (6-ish repeats) was frogged earlier this week. I have learned another lesson: USE A ROW COUNTER or ALWAYS STOP IN THE SAME PLACE. I put it down thinking I’d have no trouble remembering where I’d stopped; two days later I’d completely forgotten. Let’s assume that’s due to having more interesting things to think about rather than old age, shall we? What else is happening? It’s raining. I’m marching slowly through the garter stitch section of the Wool Peddler’s Shawl, wondering why I started with my best, most even handspun when I’ll want it for the stockinette lace-ish bit at the end. And cursing the guard hairs. I now understand why so many people say alpaca is prickly. Most of the Tuesday spinners have adjourned to afternoon garden-spinning parties for the summer break; I and one or two others who work during the day have started to spend an occasional evening of beer and fibre at the pub. Try to imagine the faces of the regulars at the bar when I marched in with two bags of books and yarn and fibre, bought a half of Broadside and settled down to drop spindling while waiting for Lyn. Such fun! I hadn’t realised that she has alpacas, real live ones, and I learned a lot about judging alpaca roving that evening. All of mine has some guard hairs, and the silk blend I love has more than most. 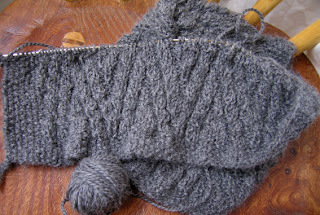 As I knit the handspun the ends of the hairs are forced up, out of the fabric, and they are incredibly prickly. I’ve started pulling them out with tweezers as I knit: I want this to be soft and comforting, not a penance. I was going to be incredibly witty here and post a picture of the Cyclamen cilicium currently flowering in the garden, but the camera would not co-operate. Now I’m wondering why such a lovely flower was named for a hairshirt. Perhaps it’s some other root entirely. Haha! It’s cold enough that the heating came on last night with the room ‘stat set to 16C (the normal winter setting). I formulated a cunning plan earlier in the year: I will not buy another sweatshirt. Instead I will knit sweaters. Ha. Anyone else here on Ravelry? Have you noticed how few people, relatively speaking, knit garments? When I search for projects others have made with my stash yarn I find scarves. Hats. Gloves, mittens, socks. Shawls galore. But very few sweaters/cardigans. My own project file is full of socks and shawls. This. Must. Change. I have yarn bought to become sweaters and it WILL become sweaters. Soon, or I’m going to be cold. That vest. Thing. It’s rather better In Real Life than it looks here: M told me it looked good on, and she doesn’t lie. Maybe the camo pants let it down? 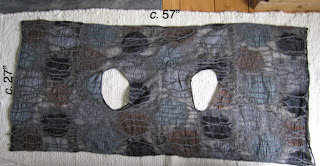 It’s a rectangle of fine nylon mesh to which bits of fine wool have been ‘Artistically’ sewn/felted. There’s a close-up at left for felters capable of artistry. 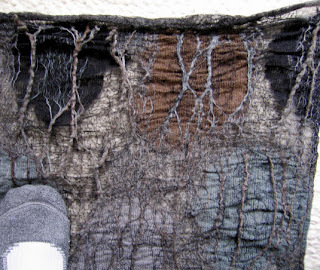 Top is at bottom (where my foot is); bottom at top, where a bit more mesh is visible and the really stringy bits are loose for a tasteful, slightly ethereal effect. The nylon gives it a bit of rigidity, so it tends not to hug the person wearing it. My alpaca version will undoubtedly hug and hang, but my theory is that if the folds are sufficiently generous and the fabric feels and looks good, the end resilt will be a different kind of elegant. Here’s a plan view for the intrigued. I’m doing a 7-stitch moss pattern border all round; the fabric itself is Pinnacle Chevron (from Barbara Walker’s First Treasury), a reversible pattern that almost acts like ribbing to encourage folds but the chevrons look slightly cabled, and I really do think it’s working with the alpaca instead of against it. And it’s an easy knit, which is important: I’m working from the bottom up, which is something over 300st and every row takes ages. Each 110m skein yields a tad over 2″, which means 11 skeins isn’t enough. Luckily the shop has some left: another 3 skeins are on their way. I haven’t decided what to do about the armholes yet. They’re 9″ high, centred in the fabric. I was just going to leave longer (10-11″ slits), but I’m toying with the idea of picking up stitches and knitting sleevish things. Or making proper holes like what the original has. And I have to decide whether or not to edge the holes with moss stitch as well. More finished look, but possibly too finished. I’ve got lots of time to decide… lots and lots of time. About 2 more skeins. I think I need some lace now, or socks. Just to cheer me up. Oh, look. A chocolate bar! This entry was posted in Uncategorized on August 23, 2007 by sarahw. Funnily enough I have had the sweater debate running in my head too. I have subscribed to Interweave Knits & await the fall issue -how long to get across the damn pond? 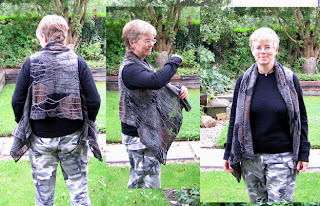 However my last jacket effort if 3/4 frogged…… & may appear as a shawl!!!!! I also have some beautiful lace weight waiting for the right project…!!!!! I used to knit successful sweaters when I was 20 & slimmer, maybe thats the issue with me anyway? You encourage me to take the plunge anyway! excuse the too many ‘anyways’ -its late! “Oh, look. A chocolate bar!” Dear Sarah, you make me laugh.Enjoy your no housework, all-spinning, knitting weekend! I make a lot of sweaters. Maybe it’s because not all of them are so complex? Your alpaca thingee looks really interesting–and I’m wallowing in a very simple v-neck tank pattern with lots of ribbing and stockinette. Thoroughly enjoying the braindead approach to knitting right now…and dreaming of your cool rainy weather!